I concluded Drink and drinking game for last day of Shark Week 2016 with this program note. I'll have more from Tipsy Bartender tomorrow, when I present this year's edition of Drink recipes for July 4th from Tipsy Bartender. Stay tuned and stay tipsy! I begin with the most recent video, Awesome 4th of July Drinks. 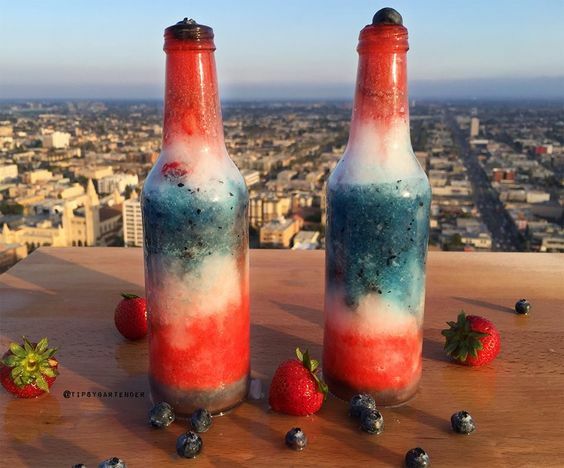 We give you two super fun drinks for the 4th of July holiday! I think Inna was trying to say either oppressed or repressed when she said that "women are pressed in Russia." That was the most recent video Skyy has posted for this holiday. Follow over the jump for the oldest on his Fourth of July playlist. Now, the 4th of July Patriot Punch. 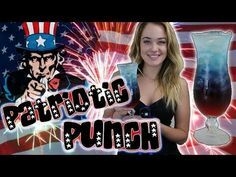 A Red, White and Blue drink to celebrate the 4th of July, Independence Day...THE PATRIOT PUNCH! This is an awesome drink with layers of red, white, and blue! It's perfect for 4th of July parties and cookouts, and this is a family-friendly recipe that can be made non-alcoholic so everyone, adults and kids alike, can enjoy it! Include this festive drink on your party menu and enjoy one of these while you watch the fireworks! We have awesome recipes for every holiday--check them out and if you like what you see please subscribe to the #1 bar show on YouTube! I'll save the Captain America drink for a post about the latest Avengers movie, which I should have made a couple of months ago, but I'll find an opportunity to make up for it when movie awards roll around. The Teen Choice Awards should be my first opportunity. There are four more recipes on the playlist, but I'll save them for next year. After all, I'm environmentalist; I conserve my resources. I'm not done with the holiday. Stay tuned for another drum corps 4th of July!